Head out the door with fast prep Paleo mini banana muffins, packed with filling, nutritious ingredients to fuel your little ones for the day! Third kid in, and I’m still learning…! I am definitely not one to pretend that I have this motherhood thing all figured out. How could you when each child is so individually different and beautiful? Certain lessons pass from one kid to the next, making little aspects of subsequent kiddos added to the mix run a bit smoother, but for the most part, I still take one day at a time figuring this thing out just like everyone else! My how my mornings have changed! One routine that looks quite different from my first born in the toddler/preschooler years to my third born is breakfast. Sure, the nutrition is still there, and my standards for quality, nutrient dense meals still remains my number 1 priority, but the mornings themselves just look different. With that first and even the second kid, there was time to help with getting those last few bites down by helping feed them a little if there was an appointment or work to attend. I dare say our mornings were pretty laid back. Even though I worked outside the home during those days, overall there were just fewer distractions and it made for easier meals. The youngest in my house has had to tag along for school drop offs, appointments, and after school activities and play dates since the day she was born. 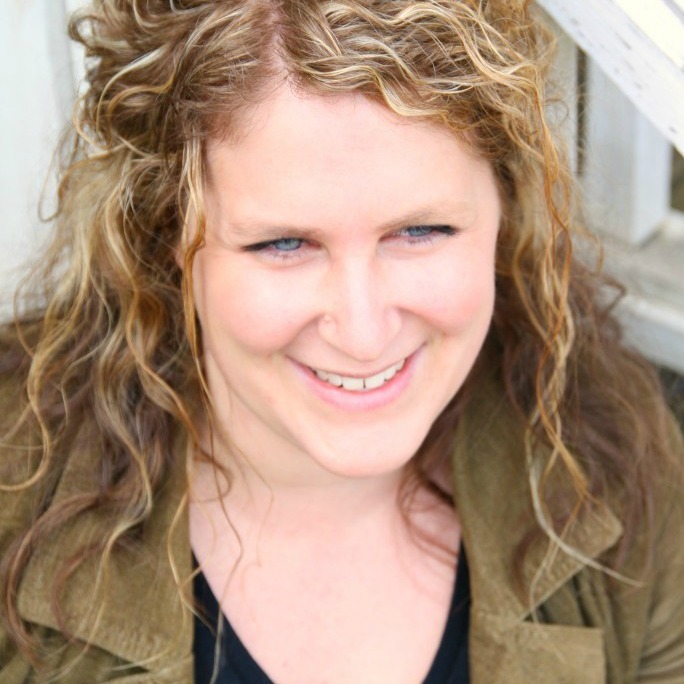 She basically was groomed to go with the flow, but we still struggle with this age that can be pokey at the breakfast table – especially when the big sisters have to be to school by 8:15. There are mornings she sleeps in, and I’m literally popping her from bed to the car seat in her jammies, and other mornings where she has it in her head she is going to play instead of eat when she gets up in the morning – and darn it I’m going to let her do that because she’s 4! Mini muffins to the rescue! 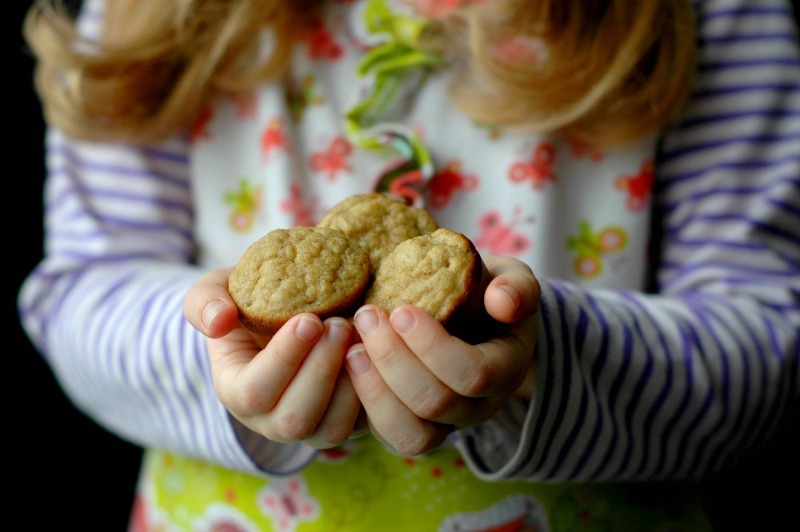 One of the reasons breakfast cookies are such a popular and abundant recipe selection on my blog, is because they were my go-to for my youngest for on the go breakfast. I recently saw some mini muffin pans for sale, however, and I thought I might mix things up a little and try some muffins. Larger muffins tend to get pretty messy, or in those smaller ages, sometimes they eat half of a large muffin and don’t need the rest. 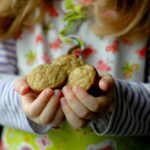 I never thought to try mini muffins – and it has been on of those lessons learned on this third kid that has really been a life saver! Because of our busier schedule, my kitchen routine has also evolved a bit with more kids. When babies are home and you are pretty “stuck” at home, it is really easy to have kitchen time almost daily. I really don’t have that privilege anymore, and so prep days are vital, and I need food that can be made in big batches to eat throughout the week or freeze to pull out easy on a busy morning. With that said, here are the goals I had for the development of these muffins! But what about filling up the older kids? 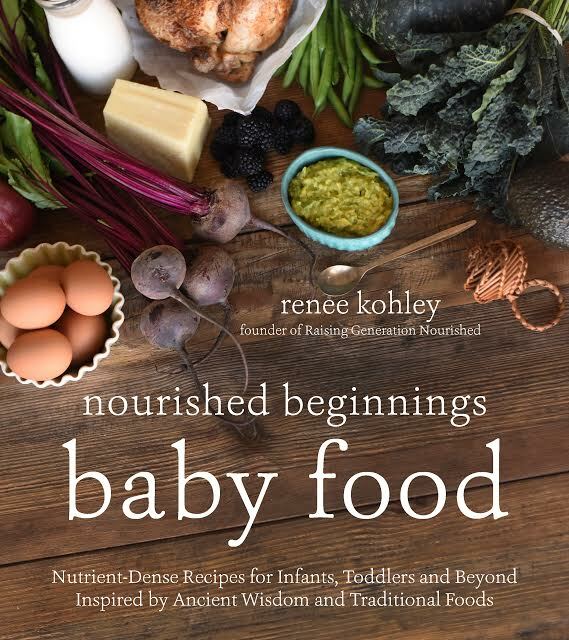 I’m all about making each meal fit for every kid in the house – you don’t need to be in the kitchen all day, dear momma. I am also finding that as the kiddos get older, they ebb and flow in and out of times of what feels like you can never keep them full! Bottomless pits if you will! During times like these (that can also happen with toddlers by the way! ), just be sure to have other options around to add to their bowl or plate of food. The muffins are part of the meal. Easy sides like hard boiled eggs, breakfasts meats (bacon, sausage, jerky, or even meat from dinner last night), yogurt, smoothies, etc are just as easy to add to the meal and will fill growth spurting kids up easily. These little muffins are a great source of fiber (coconut flour) and fat (coconut flour, healthy oil, and eggs), but unless you want the whole pan gone in one shot, here are some fast side items to balance out the plate. I am loving my 48-cup mini muffin tin! 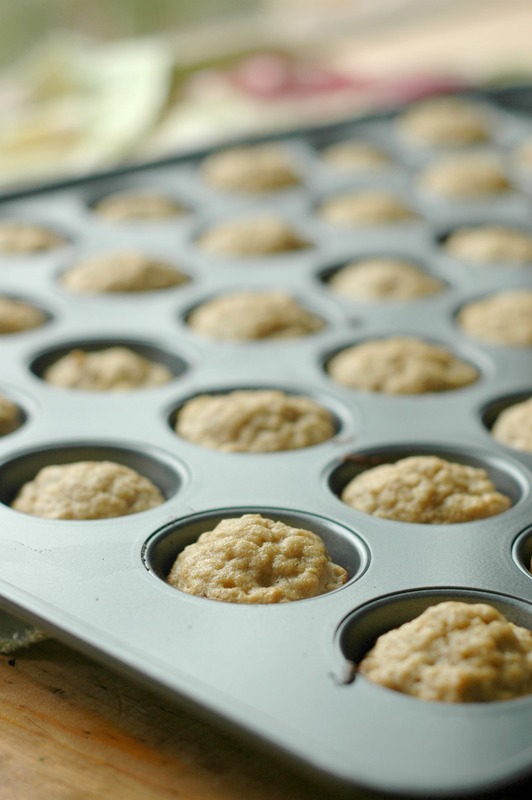 This recipe fills between 36 and 40 of the mini muffin cups, so if you have 2 of these muffin trays, you could definitely double up and put them in at the same time. To freeze the muffins, let them cool completely, and put them into a freezer bag to freeze. They can pull out to the lunchboxes and thaw by lunchtime, or you can leave them out the night before to be ready to go in the morning. Put the bananas in a medium mixing bowl and mash them with the back of a fork until smooth. Add the rest of the wet ingredients (eggs, oil, coconut sugar, & vanilla) and blend with hand beaters for 1 minute until smooth and creamy. Add the flours, baking soda, and salt and blend to combine until smooth. 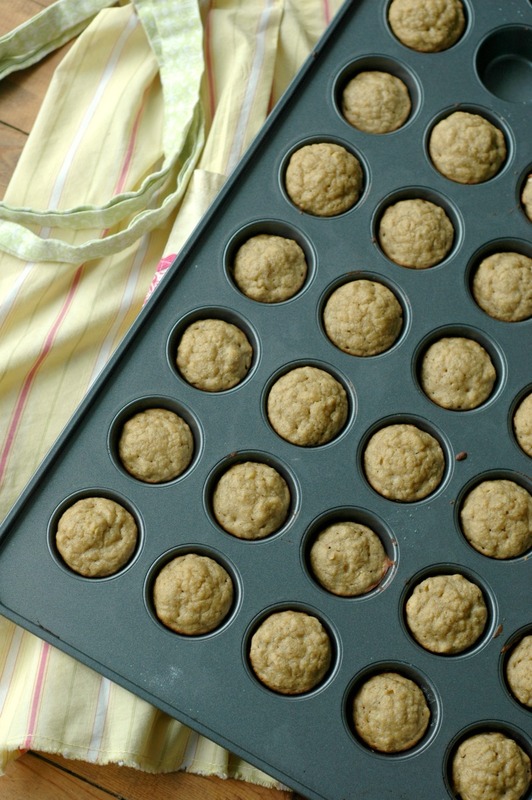 Scoop the batter into a mini muffin pan. I like to use this safe avocado oil spray to lightly grease the tin before scooping. You could use mini muffin liners or butter - I find the spray faster for so many little muffins. I get about 36 mini muffins out of this batter. Bake the mini muffins at 375 degrees for 12 minutes until golden brown and cooked through. Let the mini muffins cool for a couple minutes before turning them out onto a cooling rack. The muffins hold up really nice and are ready to eat in a just a few minutes of cooling! To freeze the muffins, let them cool completely and then toss them in a freezer bag to freeze. Homemade DIY Coconut Yogurt :: 3 Ingredients, No Cooking, & A Great Probiotic Rich Dairy Free Alternative! 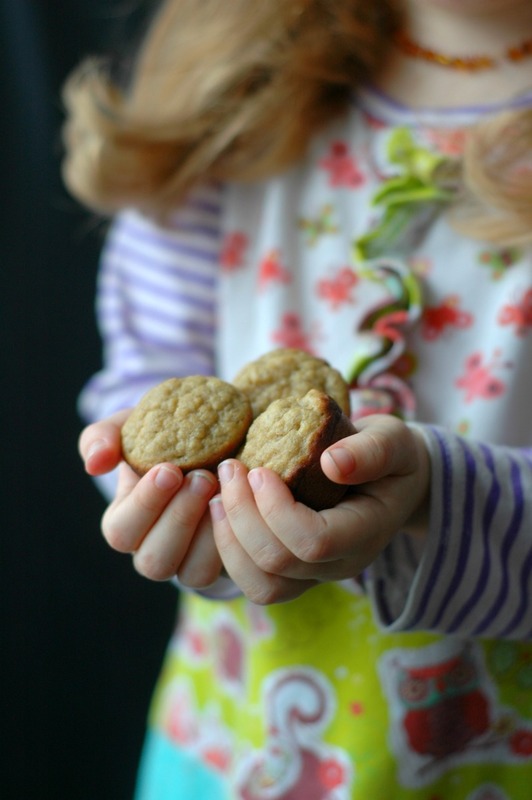 Perfect mini muffins for those mini hands! These are so cute and I love the simplicity of the recipe. Made these this morning – they were great! It was my first time cooking with coconut and tapioca flour so I was amazed at how much liquid was needed but they were perfect out of the oven. I was worried about my older son not liking the texture or it being not sweet enough so I dropped one of the Enjoy Life chocolate chunks in about half of them. It turns out they don’t need anything and are great as-is! Great Karen! Thank you for sharing! I’m going to have to try these. My kids have to be at the bus stop by 7 am, so it’s ALWAYS a struggle in the morning to get them fed and ready. We’ve done your breakfast cookies and we often just reheat pancakes or waffles, but these muffins sound like a nice change! This recipe looks quick and easy, and mini muffins are amazing, they make me feel like a giant! Great for a post gym snack or breakfast on the run! These make me so sad to be allergic to banana! I went through a super weird season of being allergic to banana – debilitating stomach aches (which I know have with mangoes for some sad reason). I did notice that if the banana was baked into something, I was totally fine! So weird. That season lasted about 4-5 years and now I’m fine with bananas again. I just don’t understand what happened there. So weird. Yum! What a healthy and yummy breakfast! Having healthy options on hand is a game changer, and it definitely helps us even though we don’t even have kids! Sometimes you need a last minute, but still nutritious breakfast on the go! 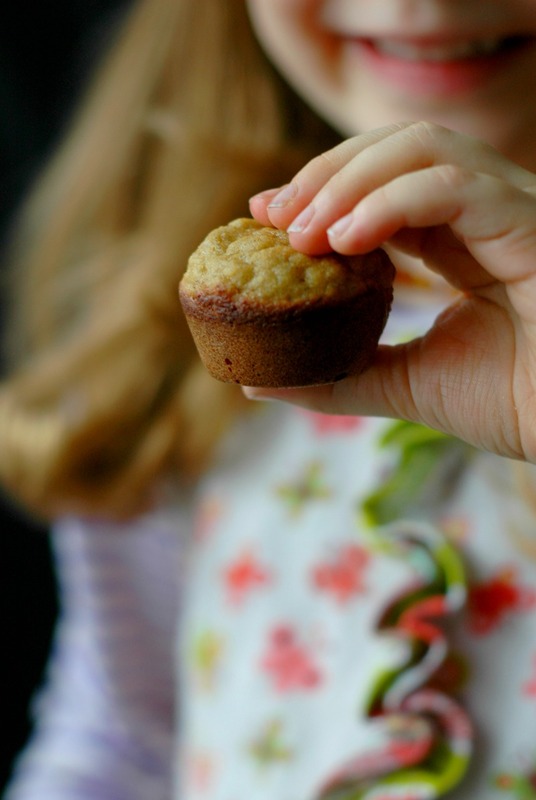 I love to make a good mini muffin for my daughter’s shared class snack! And the fact that these are nut free makes them a must-make! These are a perfect grab and go snack! THese look amazing, I know jack will love them and they’re nut free so we can pack them in his lunch! Just pinned these to make with the kids – they’d be fantastic for packed lunches, too. Thanks for al great recipe! Yum! Love a simple muffin that lets its wholesome ingredients shine! 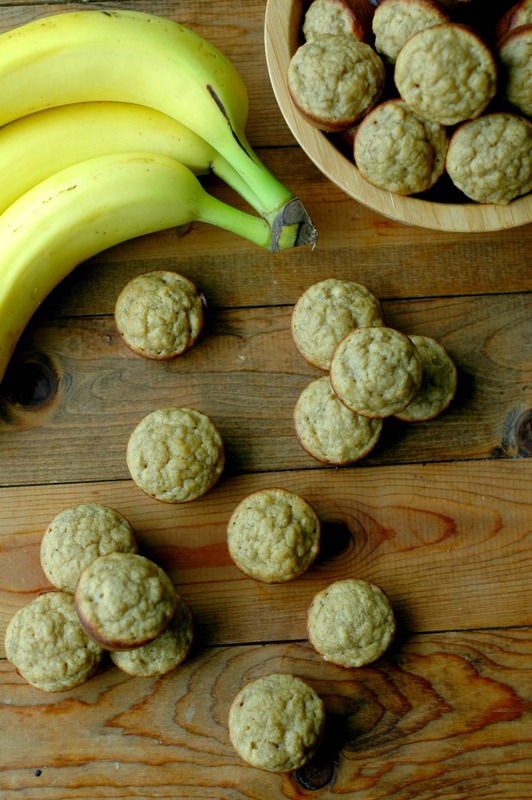 These are the best paleo banana muffins I have made. I don’t tend to like coconut flour baked goods because they can be dry and can give me gas (haha! ), but these are wonderful. My husband didn’t even know they were GF until I told him. I subbed applesauce for the sugar and they were great! My baby loves them. Love that Jenessa! Thank you for sharing! These are so cute and perfect! I need to get a mini muffin pan like yours so I can make these. I know my Tiny Love would LOVE these muffins! 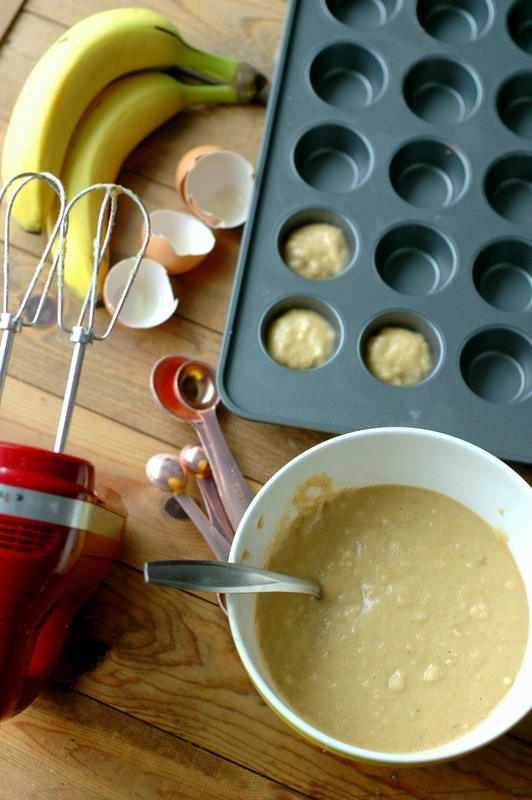 I know you have a lot of egg free recipes, we love your oatmeal muffins! Do you have one similar to this that is egg free? I’m guessing 4 eggs is too much to substitute. Hi Margret! Yes, I think egg subs would be tough in this recipe. You could do the oatmeal muffins in these mini muffin tins and use banana for the fruit and that would work well. Thank you for all your great recipes. Although i only eat a plant based diet, i enjoy your granola and grain free recipes. Do you have a suggestion of what i can switch out for the tapioca flour (i don’t use it at all). Also, i don’t use eggs either. i use, flax, chia, and sometimes psyllium husks, pureed fruit etc. Any suggestions for this recipe? 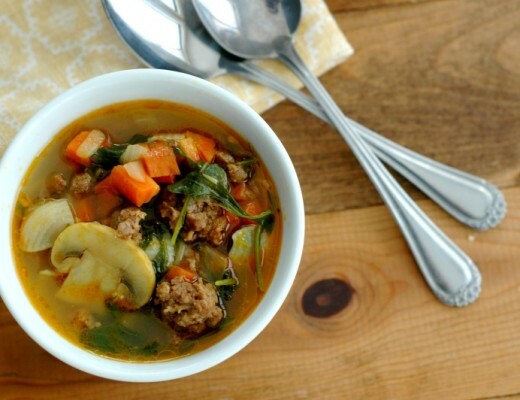 Cassava flour or potato starch should swap for the tapioca ok – the starches keep it soft. I don’t think the egg subs will work in a recipe with this many eggs – they will bind ok, but definitely won’t puff up like a muffin. So I had a question about the muffin pan you are using. I see you don’t use liners. Does the non-stick pan not bother you or is it a case of just using what you can and not worrying about it? For so long I have heard that non-stick products were not healthy and I have a kitchen that is 99% free of it. But the mini muffins intrigue me and I wonder if my youngest would start liking muffins again if she had something little and cute like these. I had Bobs Redmill gluten free 1:1 flour on hand so i used that instead and hey turned out perfect! Thank you Carrie! Good to know! Hi Ashley! I’m sure you could, but I haven’t played around with anything specifically. Whatever you try, you may want to increase the amount – coconut flour us super absorbent so you only need to use a little bit – anything else you might need to use more. I love these muffins! Any reason why this would not work as a loaf? Hi Courtney! I’m not sure how it would work! 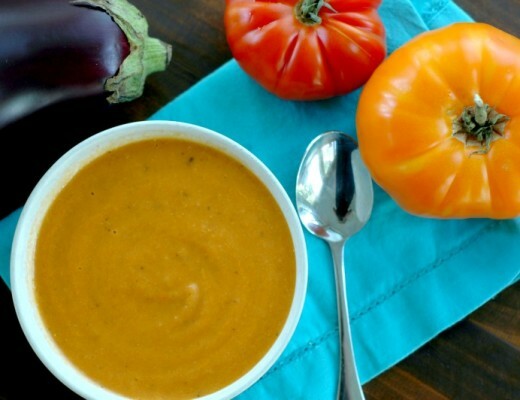 Will need a longer cook time – might be worth trying! Could you replace the flours with the Namaste Gluten Free flour like you did with breakfast cookies? Oh yum, these are the cutest! 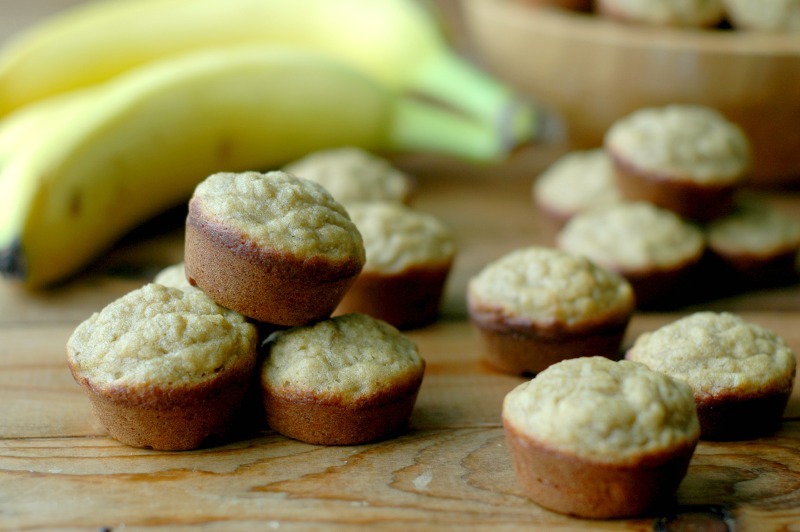 SO perfect for little hands and I love any form of baked goods with bananas.